With AquaBells Travel Weights you can maintain your weight training while you travel without overweight luggage! The totally portable and collapsible fitness solution for people on the go. At last, a portable gym that fits into your briefcase! Carrying traditional weights through airports are impractical. With AquaBells you can continue your workout program without adding extra weight or luggage for your trip. With AquaBells Ankle Weights you can also maintain your lower body workout regimen while on the road! 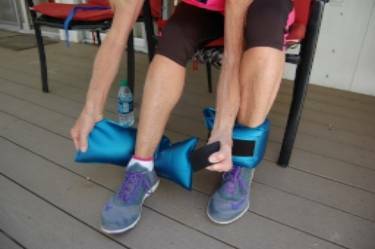 These fully collapsible Ankle Weights, unfilled weigh less than 8 ounces, and are small enough to fit into a fanny pack. Filled with water they provide up to 8 lbs. of resistance per pair. Simply fill to the 2 ankle weights to your desired weight resistance and attach with the comfortable Velcro straps. Great for physical therapy, and also can be used for water resistance programs when in swimming pools, too! Fill with air for water exercise, fill with water for land exercise.